While the Lhasa Apso is small in stature, it is not small in personality. It has the tendency to be self-sufficient, stubborn, courageous, and hard-nosed. The Lhasa Apso enjoys a daily energetic play session. It needs a moderate amount of physical activity as well. While it can be tough, it does take pleasure in sleeping next to its owner and being a delightful companion and pet. Around people it does not know, the Lhasa Apso can be slightly timid. The Lhasa Apso is an energetic breed. Its physical needs can be met through short walks or a high energy play session indoors or outdoors. The Lhasa Apso has a small stature, which makes it ideal for living in an apartment or a home. It does not thrive in an outdoor environment and should be kept as an indoor house pet. The Lhasa Apso has a signature long haired coat that requires moderate maintenance of brushing or combing a few times each week. The major health concern for the Lhasa Apso is known as patellar luxation. This is a condition that involves the knee of the dog and causes the patella to fall out of its natural groove pattern and become displaced. The minor health concerns for this breed include entropion, distichiasis, and PRA (progressive retinal atrophy), which all involve the eyes. Another minor concern affects the kidneys and is known as renal cortical hypoplasia. Occasionally, CHD (canine hip dysplasia), urinary stones, vWD (von Willebrand’s disease), and sebaceous adenitis are found in the Lhasa Apso. To keep this breed healthy, it is suggested that regular testing of the knees and eyes should occur. The average life span of a healthy Lhasa Apso is 12 to 14 years. The Lhasa Apso has an unknown origin. It was well-regarded many years ago in the villages of Tibet. The Lhasa Apso has a tie to the Buddhist religion, particularly when it comes to the subject of reincarnation. It was believed that the soul of dead lamas entered the body of the Lhasa Apso. This breed acted as a watchdog for the monasteries as well. Because of its verbal abilities to notify the monasteries of visitors, it earned the name Abso Send Kye, or Bark Lion Sentinel Dog. The name Lhasa Apso may have been created from this original name. Others believe that the name Lhasa Apso comes from the word rapso, which is a Tibetan word that means goat. The goat reference was related to the long coat of this breed. When it first arrived in England, it was referred to as the Lhassa Terrier, although it did not have any of the standard terrier characteristics. The Lhasa Apso made its way to the Western world around 1930 when the thirteenth Dalai Lama gave it as a gift. Originally included in the AKC Terrier Group in 1935, the Lhasa Apso was quickly moved to the Non-Sporting Group in 1959. 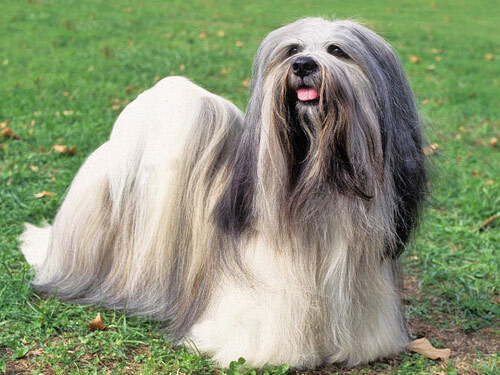 This Tibetan breed was initially modest in popularity but has grown to become one of the most popular house pets and show dogs.